When did the sculptures of the Apostles appear on the Prague Astronomical Clock? The march of the Apostles, who show themselves in the two windows every hour during the day for about half a minute, is the greatest attraction for onlookers and especially tourists. The Apostles finish their march accompanied by the figures on the clock that come into life just for that moment: Death, Turk, Greed and Vanity; the tourists applaud and then the chiming machine starts to chime. For the astronomical, timing and calendar functions of the clock, however, the Apostles are of no importance..
A peculiarity of the Prague astronomical clock is that we do not know when the sculptures of the Apostles first appeared on it. There is no factual information on this subject. The only certainty is that on 1st January 1866, after a thorough renovation, they already were there in the windows. J. Tбborskэ stated expressly in his report about the astronomical clock (1570) that there were no sculptures on the clock that would have served for entertainment of the common people as some “buffoon” performance. He described the design of the astronomical clock very precisely and it is not probable that he would have omitted the moving figures. Similarly, a hundred years later, Bohuslav Balbнn, a Jesuit, appreciated the fact that, unlike similar machines abroad, “there are no needless and ridiculous mundane figures on the clock that would be admired by boys and witless children and farmers, like on other clocks … such trifles and artificial playthings do not contribute to the value of the clock.” Later references provided by several scientists and travellers do not directly mention the Apostles either. The small windows were already on the clock in the times of J. Tбborskэ. They illuminated the machine with daylight and had the usual window shape with vertical hinges. They are depicted in this way on a drawing by Filip and Frantiљek Heger from 1793 with two figures in open windows, which is interpreted by some researchers as a proof that the Apostles were already installed on the clock. 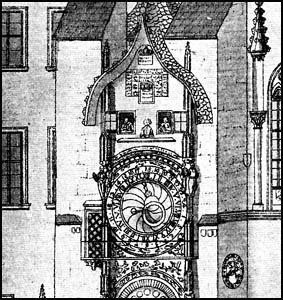 The clockmaker Romuald Boћek elaborated a similar documentation of the astronomical clock with a description and drawings in 1828, and he does not mention any moving sculptures in the windows either. However, there is a clue from 1864. The clockmaker Jan Prokeљ of Sobotka studied the clock thoroughly for several years; he exhibited its functional model in Prague and evoked a great public interest. It is stated in a magazine of that time that “When it chimes at noon, twelve Apostles appear in two small windows above the main dial, one after another…” J. Prokeљ wanted to prove that he was able to repair the machine and make it work after a long time. If the repair had been entrusted to him, it would have been possible to credit the sculptures to him. He did not get the job but he probably encouraged the Prague aldermen to make particular steps to preserve the astronomical clock. He sold his model and its whereabouts are not known today. However, only a year after the exhibition of the model, the director of Prague observatory, J. G. Bцhm, considered the presence of the Apostles dated back many years and wondered why J. Tбborskэ had not mentioned them in 1570. The circle of the history is thus closed without us knowing the date we would so much like to know. Let us consider this as one of the mysteries of the astronomical clock.